The G2G glass dry joint range offers the ideal solution for internal frameless glass partitions, giving a professional finish every time. G2G provides a suitable alternative to wet joints in glass offering reduced installation time and onsite wastage. 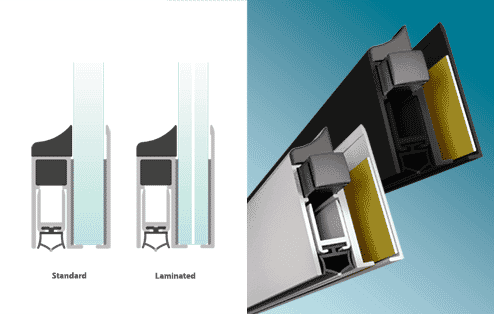 The G2G glass dry joint product range includes revolutionary door seals. Wedges for head and base systems are also available. Creates horizontal and vertical banding across glazed partitions. Flexible end sections allow for variance on the edge chamfers of the glass panels. The result being that the polished ‘flat’ edge dimension becomes less critical. The wedges grip the glass allowing a simple and clean installation in slim aluminium head and base channels. 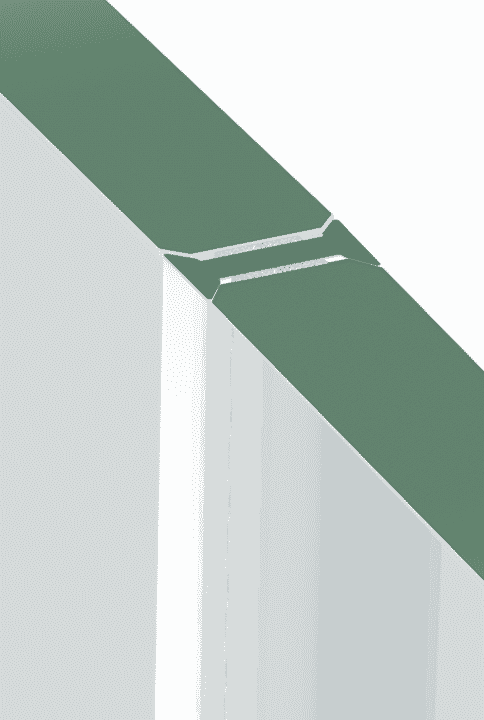 The tear-off enables compatibility with a range of companies aluminium framing systems. Suitable for standard glass thicknesses of 10 and 12mm, and laminated glass thicknesses of 10.8 and 12.8mm. To ensure the best bond between the G2G profile and the glass an application temperature between 18 to 35 degrees centigrade is recommended. It is recommended that where possible the joints and glass are equalised to room temperature 24 hours prior to fitting. A quality polished edge works best for maximum bond strength. When fitting the joints on site it is important that these polished edges are clean, dust and grease free. An alcohol wipe is recommended. It is essential that every panel is shimmed and plumbed (particular the first panel) vertically/horizontally and centralised in the base and head channels. It is recommended that prior to fitting the joint each following glass panel is placed side by side to check for bow and swapped for a flush panel if there are any showing this affect. It is recommended that ratchet strap/suckers are used when fitting panels to achieve the best contact pressure. The G2G tape has excellent initial tack and contact bond in most conditions. It strengthens to its maximum bond strength 12 hours after fitting. The compressive qualities of the G2G tape takes up some tolerance variations in the glass. This can be maximized through ensuring the glass has been cut accurately on well maintained machinery. Please note these are for guidance only, Reddiplex take no responsibility for the overall installation of a partitioning system. All of the guidance and illustrations contained are given as guidance only and specialist advice should be sought for individual applications. polished edges are clean, dust and grease free. A nominal gap of 5mm clearance is required to be left between the door leaf and the adjoining panes. For retrofit applications a gap of between 3.5-8mm is suitable. floor and then applied to the door panel. same direction as on the leading edge. Trimming will be required of the side seal flippers around top and bottom hinge patches and additional hardware. a threshold gap of up to 12mm. Q. What glass thicknesses do the G2G components accommodate? A. The G2G range is suitable for 10 and 10.8mm glass, 12 and 12.8mm glass, and 15mm glass. Q. Will the joints fit on standard and laminated glass? this is widely accepted because it does not break the surface eye line. Q. What type of edge finish is recommended? A. A quality polished edge works best for maximum bond strength. When fitting the joints on site, it is important that these polished edges are clean, dust and grease free; the use of an alcohol wipe to clean the flat polished edges is recommended. It is recommended to ask your glass supplier to cut 0.5mm smaller on the flat edge than is stated for fit and function purposes. It is ok to have a smaller flat edge;a larger flat edge than stated can cause the joint NOT to bond. Q. What Bevel / Chamfer / Arris are required? Q. What polished edge width is required? For standard glass panels of 10, 12 and 15mm, the polished flat edge of the glass should be cut to a maximum width of 6.5mm for 10mm glass, 8.5mm for 12mm glass, and 11.5mm for 15mm glass. This is the same for all of the G2G – glass partition joints, when using standard glass panels. NB: it is recommended to ask your glass supplier to cut ½mm smaller on the flat edge than is stated for fit and function purposes. It is ok to have a smaller flat edge; a larger flat edge than stated can cause the joint NOT to bond. For laminated glass panels of 10.8, 12.8 and 15.8mm, the polished flat edge of the glass should be cut to a maximum width of 6.5mm for 10.8mm glass, 8.5mm for 12.8mm glass, 11.5mm for 15.8mm glass, and 13.5mm for 16.8mm glass. This is the same for all of the G2G – glass partition joints, when using laminated glass panels. NB: it is recommended to ask your glass supplier to cut ½mm smaller on the flat edge than is stated for fit and function purposes. It is ok to have a smaller flat edge; a larger flat edge than stated can cause the joint NOT to bond. For Flexible ‘I’ Joints, the flat edge dimension is the same as the standard ‘I’ Joint but less critical. Q. Will the joint tape migrate (leak) through to the liner on the laminated glass? A. No evidence of this has been reported on our test pieces. Q. Will the joints take up potential glass bow? A. Yes, to a degree. The gel type tape used has compressive qualities, which helps with tolerance. However, it is essential to use a glass supplier that processes on well-maintained machinery to minimise the possibility of excessive glass bow. Q. Can the joints be fitted in cold conditions? A. Yes, however fitting joints in conditions below room temperature will affect the bond. It is recommended that, where possible, both the joints and glass are equalised to room temperature 24 hours prior to fitting. The recommended application temperature is 18°C – 35°C. Q. Does the tape lose its strength over time? A. No, the opposite is true for these joints. The tape has excellent contact bond and reaches its maximum bond strength in 12 hours after fitting. Q. Are there any special fitting requirements? • To ensure the best bond between the G2G profile and the glass, a recommended application temperature between 18°C – 35°C is advisable. • It is recommended that, where possible, the joints and glass are equalised to room temperature 24 hours prior to fitting. • A quality polished edge works best for maximum bond strength. When fitting the joints on site it is important that these polished edges are clean, dust and grease free, an alcohol wipe is recommended. • It is essential that every panel is shimmed and plumbed (particularly the first panel) vertically/horizontally and centralised in the base and head channels. 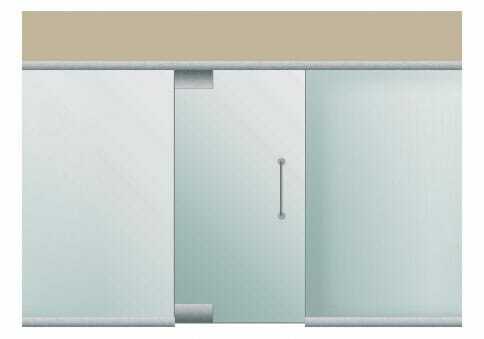 • It is recommended that prior to fitting the joints, every subsequent glass panel is aligned side by side with the fitted panel to check for bow and swapped for a flush panel if there are any showing this effect. 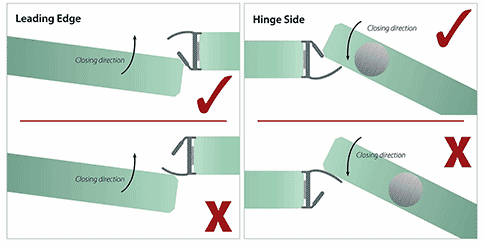 • It is recommended that ratchet strap/suckers are used when fitting panels to achieve the best contact pressure. • The gel type tape used has compressive qualities which help with tolerance, however it is essential the glass has been cut on well-maintained machinery to minimise this potential affect. Please note these are for guidance only. Reddiplex accept no responsibility for the overall installation of a partitioning system. Q. Can I fit manifestation graphics over the joints? A. Yes. The joints have been designed to give enhanced sight lines across the glass panels, in turn reducing the interference with any graphics that may run over the joints. Q. Are there any specific storage requirements for the G2G profiles? G2G profile are brought to within a temperature range of 18°C – 35°C. Q. What colour are the joints? A. Clear. The joints are designed to be as clear as possible to ensure the maximum light transmission and limited impact on the overall appearance of the system. Q. Are the joints fire rated? A. No. The joints have not been designed for use in fire rated systems. Q. Are the joints UV stable? A. The joints have been primarily designed for internal use. We are currently age testing to demonstrate the UV stability of the joints in external applications. Q. Are the joints impact tested? A. No, although we are confident that the joints will work under these conditions, it is impossible to test this in every system on the market. Q. Are the joints acoustic tested? A. No, although we are confident that the joints will perform well under these conditions, it is impossible to test this in every system on the market.